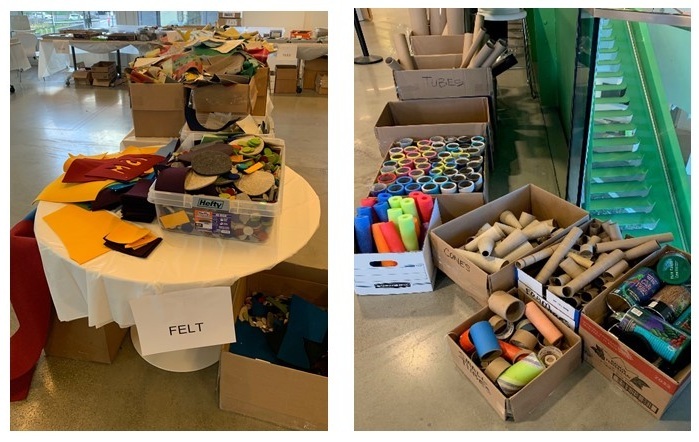 Form + Place was pleased to participate in KidsBuild! - a family program that is organized and run by the Boston Society of Architects (BSA). The two-day event is designed to bring awareness to children and their families about the steps involved in realizing new buildings. It also aspires to promote active community discourse in the planning and development of our cities. This event highlighted numerous aspects of our work that we particularly relish – engaging with the community, a collaborative process, creative problem solving, bringing ideas to fruition, and ultimately enhancing our built environment and public spaces. An imaginary city grid is laid out in the lobby of the BSA, with empty parcels mapped out. Families select a building type and site and then must obtain a building permit for their structure. They are required to consider zoning rules (primarily building height) and then design and select materials for their building. They then proceed to the Construction Zone where volunteers assist as needed in the assembly of their structure. When their building is complete it is placed on their site in the city grid where it is reviewed for inspection, rewarded for the integration of sustainable design features, and granted a Certificate of Occupancy. It was impressive to see how many families made “green” choices, for which they were awarded a green seal, in addition to a C of O. The earnestness with which the children considered not only their options for sites and building types, but also the context in which their structures would sit was endearing. Our office group volunteered on a Sunday, so a number of sites had already been claimed and built. It was striking to see how keenly aware the children were of the buildings adjacent to their sites. Their ability to imagine this city as a real entity with endless possibilities was refreshing. At Form + Place we enjoy the process of working with developers and communities to determine the appropriateness of development proposals for specific contexts. Listening and sharing ideas and experiences to optimize the maximum potential of each site never gets old. In working as the Peer Reviewer for the City of Newton on the Northland development, we continue to track changes to the initial proposal, many shaped by community input. While the original mixed-use concept included more dwelling units and retail space, it was decided that a reduction in overall square footage would be preferable. The scaling back, particularly of retail, will result in less traffic, especially when combined with alternative transportation modes that are being promoted. Rules give structure and prevent chaos. The need for this was readily apparent at KidsBuild! where children might have been tempted by the endless assortment of donated materials and an inclination to build the biggest and most impressive building. Zoning gives a measure of calculated control, which factors in the needs of the larger community. Children consulted building height measuring charts to determine the maximum height for their structure, according to the building type and zone (Industrial, Public, Residential, Commercial), and seemed to readily accept adhering to a prescribed limitation for the greater good. Norms and standards are extremely helpful, and occasionally rules need to be adjusted and updated to reflect change. In our recent work with the City of Newton, we have helped refine the Zoning Redesign initiative by facilitating input from other design professionals and the general public. Much of Newton’s built environment predates its zoning and therefore a high percentage of parcels in both village and residential districts are non-conforming. Modifying zoning can help strengthen communities by facilitating appropriate economic development, creating a more holistic and vibrant public realm by promoting contextual design. “Let’s go draw. We need an idea.” This statement was heard throughout the day at KidsBuild! and it caught our attention because it speaks directly to what we enjoy doing as architects. It describes how we think, problem solve, and how we collaboratively engage in conversation with our clients. Form + Place’s master planning work in Winthrop over the past four years has helped to create a “vision” for what the future of this community could look like. Diagrams that have analyzed urban connections and placemaking opportunities, combined with renderings and feasibility studies exploring the redevelopment of key sites in the core, have helped uncover the potential for an exciting new public realm that Winthrop is beginning to implement. “We need grass!” This was the mantra that echoed through the Materials Yard. Anything that could represent grass (fabric, felt, green rubber material, bits of AstroTurf) was quickly snatched up. While many of the children were focused on details that they thought were of paramount importance (making sure they had something to represent the books in their library, the right string for the swing in their backyard, and baked goods for the bakery), ultimately they were faced with the challenge of constructing a building that would stand erect and hold together using glue sticks and packing tape. The enthusiasm of the children was a delightful reminder of the excitement of the creative impulse. Sometimes architectural detailing can seem tedious, but to craft thoughtful solutions to technical problems requires a commitment to creative problem solving. The moment of realization is what we all look forward to, and ultimately it is the reason we undertake design problems. At KidsBuild! it was thrilling to see family teams carry their finished project to their sites and seek approval from an Inspector. This generally involved the children describing their buildings and the decisions that they made in creating their structures. The finished KidsBuild! city was a spectacular manifestation of collaborative effort, chock-full of well thought out structures and spaces. Seeing the MGM Springfield project open in 2018 was similarly thrilling. Beyond the celebratory opening, however, it is especially exciting that the project realized a vision to reinvigorate the downtown of a historic city that has “great bones”. The combination of historic preservation, a revitalized public realm and a catalyzing combination of uses make this mixed-use entertainment facility a key economic engine for the future of Springfield. Our passion for shaping cities drives our commitment to the collaborative process, and it was fun to be surrounded by collaboration at the KidsBuild! event. We believe that it takes a village to produce well thought out buildings and places that work for all. The BSA’s emphasis on community building at their wonderful family program resonated with our team as it underscores an important part of our firm’s mission. We attended a recent presentation and discussion on ‘Designing Boston: Building Community’ conducted by the Boston Society of Architects (BSA) about what it means to practice public interest design. In this conversation, public interest design is used to describe a participatory design practice focused on social, ecological and economic sustainability for communities through addressing societal issues. A range of perspectives were voiced during the talk, from large architectural firms providing pro-bono work to design-build studio classes. Public interest design can take many forms but often it will address large scale societal problems such as homelessness, affordable housing and sustainability. This type of work requires more than the typical design team and how they are engaged can have a dramatic influence on the outcome of a project. For example, Gail M. Sullivan spoke about Studio G’s Y2Y Harvard Square project for homeless youth. Following a participatory process, the firm sat down and listened to the needs of these individuals. The design challenge was to create spaces that are gender neutral and yet are also safe for those who identify as female. The resulting design includes individualized sleeping and bathroom areas designed for all end user’s needs. While this architectural design alone cannot solve homelessness, it is an example of using architecture as a platform to facilitate the support efforts of organizations that address societal issues. How much should this mindset be incorporated into the daily practice of architects and designers? Can it be used to implement a more democratic design process in typical projects? What are the implications of this process? When architectural designs are vetted through a public process, a large number of voices influencing the design parameters can increase the difficulty of consensus building. In these instances the architect often takes on the role of mediator, weighing and balancing the concerns of the public and the local government with the needs of the project proponent. On one side, the public may be viewing the developer as an outsider that does not understand all the intricacies of a certain community. This perspective can lead to pushback, but as Sam Batchelor from DesignLab noted in the discussion, it is a necessary and healthy type of tension and challenge. It requires the architect to design a compromise that promotes a developer’s vision but in return respects the public’s concerns about their changing neighborhood. Between these competing visions lie the creative efforts and explorations that lead to solutions that can benefit all parties. But how might we implement a process of design and compromise that leads to positive outcomes? In approaching a design process within an engaged community, there are some key factors to bear in mind. To create trust and address community needs, the design team must be present with the public, listening and employing creative problem solving at important stages of the process. Engaging in this manner allows the public to feel heard and to know that their concerns will be addressed. Architecture alone cannot address all the larger social issues surrounding a project but integrating a democratic process through public interest design gives designers insight they would not otherwise have as community outsiders. In our experience at Form + Place we know that finding a delicate balance between community engagement and a development’s vision requires many voices at the table, but of course, this adds to the challenge of addressing multiple concerns. The BSA discussion seemed to conclude that it takes a great amount of listening, respect and creativity to garner the trust from the public that we, as architects and developers, will design a context-driven project that will benefit the community. At Form + Place we concur with this approach, as evidenced by our work on the Wayland Town Center Master Plan. The process included many public meetings to create a new Mixed-Use Overlay District complete with design guidelines and development regulations. 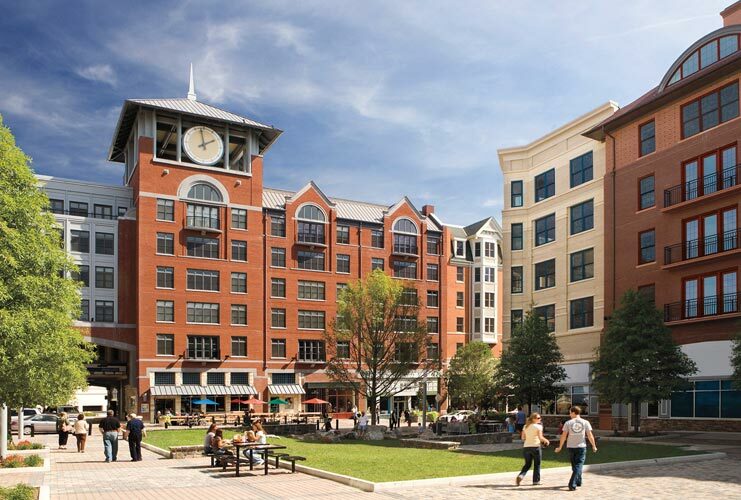 As a result, a 375,000 SF mixed-use project was permitted to be realized in a historic New England community. For the community, however, the size, style and the overall scale of the development were a concern. It is typical in these processes to need a certain amount of education on all sides. In this case, the developer and architect needed to understand that the town wanted to maintain a traditional New England village style in terms of buildings, forms and placemaking. Similarly, the community needed to be assured that the impacts on the town – such as the traffic, infrastructure, services and schools – would not be too onerous. Despite these challenges and years of negotiating zoning regulations, the result was a Mixed-use Overlay District [MUOD] Master Plan and Design Guidelines which was sensitive to the surrounding context and incorporated numerous public amenities, including a new town green and a site dedicated to a civic building. Ultimately, the design resulted in a successful compromise between the community, city and developer. In the end, an architectural project belongs not only to the owner and building occupants, but also the community. While community design may require more effort, time and resources, it has the potential to impact not only those involved in a single project but also larger social structures as well. It can create new transit infrastructure, produce a gathering space or create a public service for entire neighborhoods. These larger systems influence community members’ feelings of belonging and safety in their own neighborhoods. The reality of the design practice is that there are "invisible lines that architecture can't solve for" as Patricia Nobre, Senior Design Strategist at Gensler stated during the panel discussion. It seems evident from our experience here at Form + Place and considering the ideas discussed in this conversation, that public interest design can highlight those lines and fill the gap where the built environment cannot. As we continue the conversation forward, we ask ourselves how to ensure that developers and design professionals make this an integral part of their process. Taking on the responsibility of implementing democratic design processes will provide additional challenges but will allow the design team to reveal and address often disregarded societal issues that affect the overall success of a development. Through a number of newly proposed zoning amendments, Needham can shape its future to create the possibility of more diverse housing options, more beginning and end of life care options, commercial thoroughfares that are less strip than street, and town gateways that are more than just exit ramps to traffic arteries. How does zoning do all this? Well, zoning doesn’t do all this directly, but it does create a framework through which developers and the community can propose ideas that put forward more density or more clever ways of using real estate and the existing building stock. Democracy is wonderfully and frustratingly messy. Changing a zoning ordinance through an open public process challenges us to listen, speak and understand the possibilities that purposeful zoning can set into motion. Currently on the town’s docket of issues to deliberate are three very different zoning amendment proposals that, from very different angles, stand to shape a newly diverse range of residential types and placemaking strategies. At an open public hearing on the evening of January 29th each of the three proposals was summarized by the planning board and commented on by members of the public. The comment and discussion period was spirited to say the least. Input ranged in equal measure from firmly against to excitedly in favor with plenty of cautious optimism and critical skepticism in between. The first proposal to amend the town zoning by-law would permit Accessory Dwelling Units (ADUs) in single family homes. The additional dwelling unit as currently proposed would be for occupancy by family members related to the owner or care givers of family members. The details of the proposal are geared to insure against ADU’s morphing into straight up two-family residences and as such they include definitions and time tables for re-permitting the ADU on a regular basis. While the details will be debated and sorted out, imagine if you will the kind of future this could represent for Needham residents. Today in Needham, two-parent households often include both parents working full time to afford to live there, save for their children’s college education, and save a little something for retirement. Nanny / au pair solutions can be critical to creating a workable situation and if the care for a young child were to involve a grandparent or other family member, intergenerational living in two households under one roof could help reinforce family bonds and long-term community connectivity. At the other end of the spectrum, planning for end of life care could be enhanced by the ability to have an elderly or sick loved one living in a separate self-contained dwelling unit that is connected internally to the principal dwelling residence. This seemingly logical concept illustrates some of the challenges of broad stroke zoning ordinances. Traditional approaches to zoning differentiate the needs and priorities for residential and commercial properties, for example, which can restrict the implementation of common sense solutions that take into account the way we live. Today’s trend in zoning ordinances toward creating Mixed-use and Transit Oriented Development Districts belies an understanding that in certain cases there needs to be transitional districts between Commercial and Residential. The second proposal discussed was to create a Transit Oriented Development sub-District (TODD) on the current Hartney Greymont site at 433 Chestnut Street. The proposal would allow for a multi-family housing development of up to 148 residential units. Bounded by railroad tracks and an electrical sub-station, it’s an odd site to say the least. As a designer of commercial developments, I can tell you it would be a challenge to accommodate many program types on this site, including new retail, condos or expanded commercial/office uses. A developer is proposing a five to six-story apartment building on this site made up of one and two-bedroom units and 12.5% affordable units. While the proposal might seem out of place, given it’s height and density, it is important that we plan for other housing options in Needham. Creating TOD districts around Commuter Rail stations is a logical and smart strategy to manage the inevitable growth of the town. Creating more options for empty nesters, lower income residents, and those needing and wanting to downsize while staying in a familiar community, is a critical issue for the town to address. 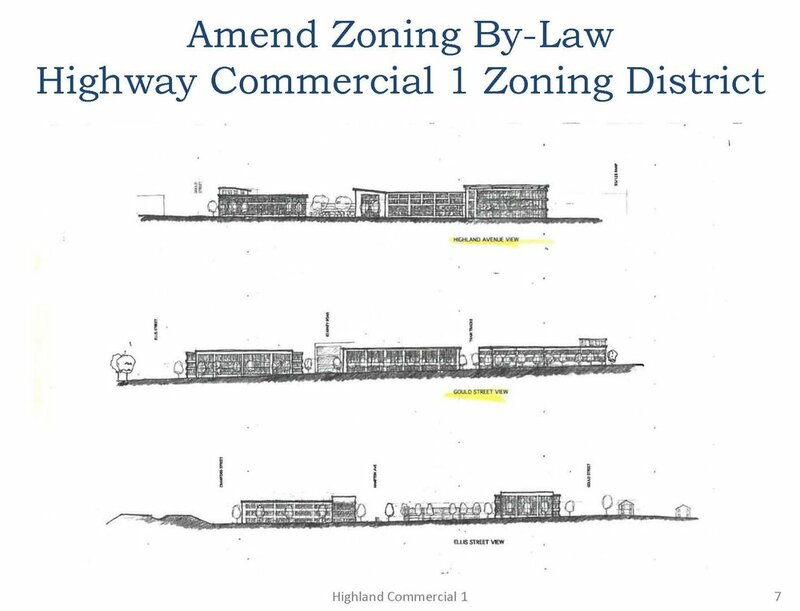 The third zoning amendment being debated by the town is a proposal to create a new Highway Commercial 1 Zoning District in the area often identified as the “Muzi Ford” site, which in fact covers a larger footprint than just the Muzi Ford business (see plan above). The purpose of this proposal is to maximize the economic value of redevelopment to the Town and subject certain uses to proper vetting through a special permit process. This proposal seeks to accomplish the goal of maximizing economic potential through increased commercial density and increased allowable building heights both by right and by special permit. In the end, it is valid to ask, “Will this development be better?”, and while it seems that some of the massing diagrams presented by one community member were somewhat unrealistic, real steps can be taken in a master plan process to provide flexibility and certainty for both the community and potential developers alike. The thing to keep in mind is that what good zoning does is both act as a catalyst as well as set a framework for the possibility of thoughtful future development. Zoning changes are generally more successful when they are thought of holistically and formed by a community visioning and master planning process. If a town like Needham can articulate a community vision and put in place a process for review, comment, revision and approval, then the messy democracy that is our reality might just be able to survive and sponsor a way forward. I recently had the opportunity to co-chair a day-long Urban Land Institute Technical Assistance Panel [TAP] that contemplated the future of East Milton Square. This neighborhood center is one of only three business districts in a community where commercial uses contribute a mere 3.8% of the Town’s tax revenue. While East Milton Square has very passionate and engaged neighborhood stakeholders, it remains a village center that is characterized by physical barriers – most notably, it is bisected by I-93 – that present challenges to its walkability and overall cohesiveness. The 2015 Milton Master Plan championed the introduction of mixed-use development into the Town’s commercial cores to expand the diversity of housing types and, in turn, to stimulate the integration of more commercial and civic amenities. Creating a “Vision Plan” for each of these districts through a process that effectively engages residents and local business owners would certainly be an excellent first step. In recent years, a great deal of focus has been directed towards renovating the Manning Community Park, which sits atop a depressed southeast expressway. While a thoughtful redesign of this significant open space, including more pedestrian-friendly connections across the busy surface roads of Granite Avenue and Bryant Avenue, will make this park more usable, it may never become the “center of gravity” for the district given its perch above the highway. In fact, one of the ULI panel’s primary conclusions was that the Town might want to consider expanding its Business District to the east of the highway along the Adams Street corridor as it reaches out towards the Quincy line. One key question for any community contemplating the revitalization of a commercial core is how to be proactive in promoting the kind of development that is compatible with the surrounding neighborhood. When thinking about the critical role of public-private partnerships in this equation, community leaders should not only look at what incentives would attract private investment but, also, what improvements the public sector could make to enhance placemaking potential. The Town of Winthrop is doing just this, as they take concrete steps to implement their 2017 Center Business District [CBD] Master Plan. This plan, authored by Form + Place in conjunction with MassDevelopment and the Metropolitan Area Planning Council [MAPC], identified a long list of action items for the Town to address, including improvements to infrastructure, the rethinking of the “connective” role of public open spaces and changes to zoning regulations that would stimulate appropriate mixed-use development. Regardless of which community, ensuring that there is an understandable and reasonable approvals process in place is essential for attracting quality private development. But, as evidenced by recent resistance to proposed mixed-use development in East Milton Square, having a community vision in place that local stakeholders have already bought into is equally important. Embracing local developers who share in the vision and have a first-hand understanding of the community is often likely to yield more contextually-sensitive proposals. Larger national developers, however, are often the ones who may have the resources to withstand lengthy approvals processes and this may result in more formulaic development solutions. A well-conceived “Vision Plan” can create a road map for public investment in a key mixed-use commercial district. Identifying placemaking goals that promote a safe, walkable center is a logical starting point for any community. Whether integrating the tenets of Complete Streets, identifying new public open space for a range of active and passive uses or incorporating design guidelines that shape how buildings interface with the ground plane, there is so much that communities can do to shape the character of their commercial centers. Proactive community investment in the public realm and infrastructure, more often than not, will serve as a huge catalyst for the influx of private development dollars. *Use this link http://milton.vod.castus.tv/vod/?video=80ee396d-5f0f-467e-b6ac-a246ff666808 to see the full Milton TAP presentation starting at minute 10. When one thinks of a great second floor office lease to complete the picture of a vibrant retail center, you couldn’t really ask for better than the Examity space at Newton Nexus. The existing second floor shell, recently retrofitted by Form + Place and Construction Coordinators Inc (CCI), spans the entire second level of the endcap building above Boston Ballet and Boston Ski & Tennis and now serves as a catalyst of visual interest and light to and from Newton Nexus. The space itself is long and very narrow in plan and the strip windows perched above the retail center show it off from the ground as well as provide a panoramic view of Nexus and ample natural light for Examity employees. The long proportions and potential for significant natural lighting of the space informed the character and design resolution of the project. In some places, however, the existing shell posed challenges that required team decision making on the fly. Some days we were literally designing as we stood in the space with Examity, CCI and Crosspoint Associates - the landlord and developer of Newton Nexus. It was quite a collaborative effort! From the start Examity conveyed that they wanted a very open environment with a central focus on food offerings throughout the day for employees. Michael London, CEO of Examity asked for a “great café feel” when you enter the space; something welcoming with a hospitality focus. This presented the opportunity to create real synergy with Newton Nexus as the feel of wide open and inviting experience continues up and into the Examity space. A critical piece to creating an airy and dynamic environment was to design an open ceiling in as much of the space as possible. The existing hung ceiling was 8’-5” above the floor and made for a pretty oppressive environment, but demolishing the ceiling wasn’t possible until the lease was completed, and by the time it was finally executed, the schedule was tight in order to be open for Examity’s busy season. Once the ceiling was opened, the design changed radically to accommodate the existing HVAC and cable trays, gain more headroom and highlight other “latent features” such as the unique grid of concrete beams supporting the roof. Despite the tight timeline, Examity asked us to continue to explore the potential in exposing more and more of the ceiling, which in the end, makes for an edgy and fun space to be in. Another existing condition that turned into an opportunity was a hidden structural wall with a long window opening that was tucked into the middle of the space. When the first addition was added to the building several decades ago, this piece of exterior wall was simply framed over and left concealed in drywall partitions. Since we couldn’t just remove it without causing structural issues, the project team decided to keep the wall, open the old window, and capitalize on the condition by creating a bar area for gathering and socializing. Examity celebrated this idea further by displaying vintage liquor and wine bottles at the sides of the bar to increase the sense of placemaking and respite from the work day. As previously stated, the parti for the plan solution is mostly driven by the existing building context. Because of the high clerestory-like windows on the “back side” of the space overlooking the Boston Ballet roof, the logical space planning diagram was to gang offices, conference rooms and other enclosed spaces primarily along the back edge and allow the larger windows overlooking Nexus to flood the open office areas with light. The larger context of the retail center and activity of Needham Street, seen from these strip windows, further sets the mood of a vibrant and active setting for Examity. Mixed-use synergy across the continuum of placemaking is a great plus for any working environment, be it office or retail. Not too long ago these kinds of stories did not exist along Needham Street and the N-Squared Innovation District, but now, with thoughtful panning and programming, we are beginning to see a variety of placemaking efforts and a synergistic mix of uses that make this regional node a desirable place to live, work and play. Rewriting Newton’s Zoning: Can it be Contextual and Aspirational? The City of Newton, Massachusetts is going through an extensive process to rewrite its Zoning Ordinance. This is a major undertaking for a City in which 85%-95% of the parcels have a non-conforming aspect. That may seem like a surprisingly large percentage, but many long-established communities have considerable building stock that pre-date their current bylaws. In Newton, nearly three-quarters of the City was built before the establishment of the 1953 Zoning Ordinance. Many see zoning as an impediment to forward-thinking development, while others believe that it is a helpful tool for preserving the unique qualities of a place. Perhaps it is not so black and white. One of the challenges for any city attempting a comprehensive rewrite of its zoning is to convince its constituency that the new ordinance will ensure that future development will be contextual. Outspoken community members know what they don’t like and often default to a NIMBY platform. As such, it is a smart approach for a city to say that new regulations governing both residential and village contexts will increase the likelihood that new development will complement the scale and spirit of the existing context. However, it is also important to consider the aspirational side of the equation. In a recent two-part forum for architects and designers held by the Newton Planning and Development Department and facilitated by Form + Place, a Newton-based architecture and planning firm, participants explored the ramifications of proposed site and building design dimensional criteria. In introductory remarks, the City reiterated one of its guiding principles, that what matters is a building’s relationship to its neighborhood, not to its lot. This underscores Newton’s desire to move away from Floor Area Ratio [F.A.R. dictates that the square footage of a building be directly proportional to the size of the lot on which it is being developed] as a key determining factor for what one can build on a specific parcel. One of the biggest issues that the City is trying to address with this approach is to prevent developers from purchasing oversized lots or assembling contiguous parcels in order to build “monster” houses or commercial buildings that are not appropriately-scaled for their immediate context. 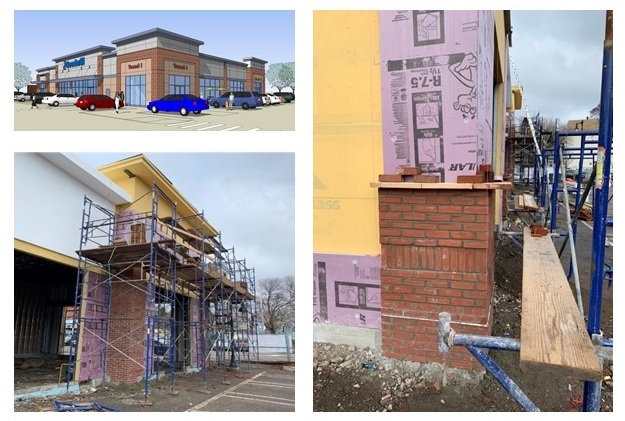 While it is easy for community members to say that a building is too tall or that having a drive-through in a village context ruins the feeling of a well-defined shopping street, the question of how prescriptive a zoning bylaw should be with respect to building and site design criteria remains a source of much debate. During the forum, designers looked at a range of sites, including a couple of key parcels in Newton Centre. While the reuse of the City-owned triangle [parking lot] at the core of Newton Centre has often been the focus of redevelopment speculation, participants explored the surrounding blocks, asking questions such as whether one-story retail blocks are adequate to define a village center with significant open space, and how does one find the right balance between the pedestrian and the automobile in a location where there is multi-modal transit access. What is the appropriate balance of development and open space? The question remains, how aspirational should a zoning bylaw be? Rewriting a regulation so that a great deal more of a community’s existing buildings and sites are conforming is a good starting point but, when a developer with significant land holdings puts forward a vision that will impact a substantial part of a city, there must be additional mechanisms available to define an approvals process that is adequate to vet the design. The City of Newton currently has numerous large-scale projects in the works, including along the Washington Street corridor, at the Riverside Station and on the Newton-Needham line. While projects of this scale need to be addressed on an individual basis through specific mechanisms that are outside of an overall zoning regulation rewrite, they should be considered holistically by a community. In Watertown, Form + Place recently helped write a new Regional Mixed-Use District for industrial lands along Arsenal Street to help facilitate the development of Arsenal Yards. This project came to fruition because the Town had a Comprehensive Plan in place that outlined aspirations for the redevelopment of this area, and a development team – Boylston Properties and The Wilder Companies – came forward and was willing to work with the Town to help execute a shared vision. The Newton community should be open to a similar process and should position itself to take advantage of the visionary opportunities that public–private partnerships can bring. Whether defining new overlay districts or utilizing a master plan special permit approach, there are many mechanisms available to allow for adequate oversight through a well-defined approvals process. Most of the large-scale development currently happening is proposed along major commercial corridors but residents of village centers such as Newtonville and West Newton are certainly feeling change. The challenge for a community such as Newton is to be proactive and aspirational. There are many successful models for Smart Growth that are currently being implemented in similar communities throughout the northeast. So, instead of being fearful of large-scale development, stakeholders should ask themselves how they can help shape proposed development so that it can be both contextual and forward-thinking. It’s a common reaction, heard increasingly these days at public hearings and other gatherings to discuss and deliberate proposed developments. But how tall is too tall? How many floors is the right number of floors? Does the old Supreme Court obscenity standard "I know it when I see it" apply to deciding when a building is too tall? Or can it be more subjective than that? The context of any project is critical to understanding it’s massing. Ask yourself what kind of buildings are surrounding the development. What kind of buildings, if any, stand on the proposed parcel now and will they be part of the new project or razed (partially or in full) to make way for the new development? Also ask yourself what the context provides as key infrastructure supporting the kind of density that could translate into massing that one might perceive as “tall” or even “tower-like”. For instance, is there good highway access, a nearby greenway and perhaps most importantly is there access to public transportation? As urban designers we ask ourselves these questions because in order for our cities and towns to continue to thrive, they must also continue to grow, and manage that growth with an eye to future sustainability. Population growth and location statistics make it pretty clear that soon more of us will live in “urban” areas than will live in “non-urban” areas. The road to sustainability is not through single-family style sub-urbanism, but through smart growth that clusters and densifies development around existing and expandable infrastructure. So, if context is everything, but allowing for certain density and height is a critical part of sustainable development, then is the existing scale (height and general bulk) of a neighborhood still a relevant metric for judging the appropriateness of the scale of a new development? Truly a million-dollar question. We would argue that yes, it is still relevant, but it needs to be understood as being most important at the point of transition (i.e. the public realm between the buildings) and that understanding the public realm as a “continuum of placemaking aspirations” is critical. Taller more dense projects tend to act as nodes of regional interest and gateways between communities. As such they owe a bit more to the community in terms of placemaking and civic vitality. These larger projects offer terrific opportunities for placemaking. For instance, between the buildings in a development, or between a new development and an adjacent neighborhood, there are many potential types of spaces and amenities such as streets, with their attendant sidewalks, parking spaces, crosswalks, street trees, benches, etc. There are also small parks with public art, fountains, landscaping, and lighting considerations, as well as outdoor cafes and other dining areas. The continuum of spaces that we encounter in a good walkable neighborhood, sets up our perceptions about whether the buildings are out of scale with their surroundings or somehow in dialogue with the places they are a part of. In other words, if the placemaking is generous enough, it really diminishes the importance of height as the key metric. The architecture itself is another critical piece of the equation. Ask yourself if the tall building your standing next to takes some appropriate measures to acknowledge the scale of the human body. Is the ground floor publicly accessible (after all not every building can have thriving retail on the ground floor)? Does the design of the building somehow mark the first story, or maybe the first two stories, in a way that acknowledges the scale of the pedestrian and the activities of the street? Does it have smaller massing elements that act as a transition between the public space and the larger bulk of the building? Does it feel like there is an implied zone adjacent to the building where people are in fact supposed to be and can take some measure of ownership of the public realm? What do we want our cities and towns to say about us? We’ve been thinking about this issue a lot lately. As architects and designers of places as well as buildings, we think there is an imperative to think democratically. That could obviously manifest itself in many ways but to us this means that as part of our general contribution to solving the region’s housing crisis (and there is a regional housing crisis) we need to look away from the old suburban model of “one lot - one house”, and be strategic about clustering housing in locations that make sense and allow greater numbers of people access to critical necessities like public transportation, urban green spaces, recreational areas, walkable neighborhoods, and civic vitality in general. While building height is an easy lightning rod for quick judgement of the “size” of a proposed development, we would argue that the quality of placemaking inside and around the project is a more important measure of its appropriateness. Instead of asking if it’s too tall, ask if it seems like you could “feel at home” walking down that street. Could you take temporary ownership of a portion of that space as you engage in the act of citizenry? Has it been made with you in mind? Does the space know it and does the building know it? If yes, we would contend that the building height is appropriate, if no, then we would say it is out of scale with and perhaps inappropriate for the site in question. The Shops at Riverwood is a project owned and developed by Finard Properties. The site is located in Hyde Park, Boston, MA on the grounds of the former Bay State Paper Mill along the Neponset River. The adjacent water way and surrounding neighborhood make this an intriguing development site; one especially well-suited to thoughtful tenanting and consideration of the needs of the surrounding community. Currently, the site contains two completed buildings, but it will eventually support a handful more, collectively creating a well-rounded retail center. Finard Properties has worked tirelessly with local civic and political leaders and the Boston Planning & Development Agency to carefully select a development opportunity that serves the community’s needs, as the next component of The Shops at Riverwood. Adding a 11,000 sf Goodwill Industries store as a key anchor tenant truly strengthens the sense of community that this center aims to foster. Goodwill’s goal of providing job training, employment placement services, and other community-based programs for people who have barriers preventing them from otherwise obtaining a job, along with a project master plan that will ultimately include a mix of grocery, dining and small shop retail, as well as the new Boston Preparatory Charter Public School directly across the street, insure The Shops at Riverwood will become a centerpiece of this diverse neighborhood. The current building site includes a Price Chopper and a Dollar Tree. Additional tenants will include a Burger King and, of course, the new Goodwill Industries store. Form + Place is proud to be part of the Finard Properties team. We are pleased to have created a design that is in keeping with the existing site context while meeting the needs of the developer and tenants. We look forward to continuing to work with Finard and the construction manager, The Stukel Group, during the construction phase of this project. We have every expectation that The Shops at Riverwood will be a great success for everyone involved, but most importantly, for the neighborhood that it serves. Last month, MGM Springfield opened its doors to the public. The $960M casino development in Springfield, Massachusetts will do much more than bring a new gaming center to the area. Surrounding the main resort is a hub of entertainment venues and cultural attractions designed to revitalize the city’s central business district, including an open-air performance venue positioned between the State Armory building and landmarked First Spiritualist Church. Working with Newton-based architecture and planning firm Form + Place, MGM Springfield and its local development partner, Davenport Cos., implemented the design team’s recommendation to turn retail and entertainment venues “outward” to engage Main Street. While most casino concepts focus retail and entertainment “inward,” keeping visitors within the space, MGM Springfield’s strategy promotes the redevelopment of the surrounding urban environment. 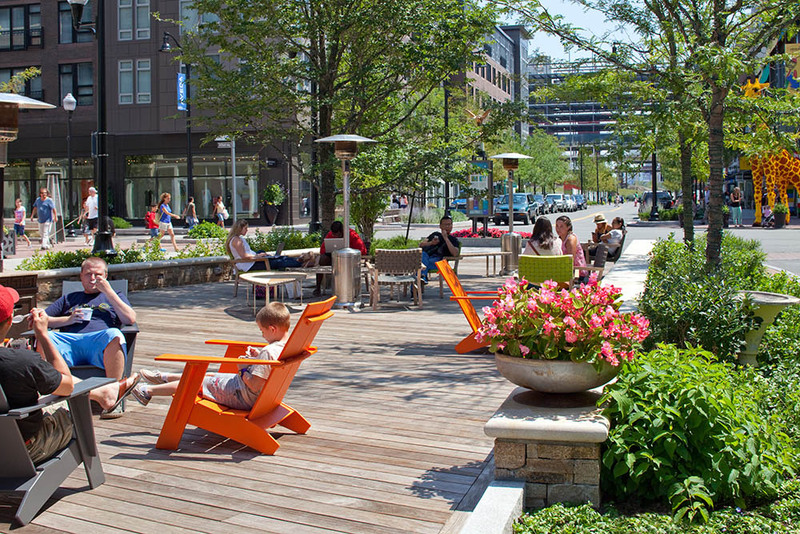 Through placemaking, developers can emphasize walkable centers, which in turn revitalize streetscapes by connecting them to flexible and programmable open spaces. MGM also paid close attention to scale. Rather than insert a megablock-sized project onto an established and historic main street corridor, which would feel out of place, MGM incorporated existing facades to create complementary urban spaces. The result is a project that is well-integrated with its location. While communities may change physically or culturally over time, each moment of a city's history leaves behind qualities that continue to define it. Sometimes, in many urban centers, changing use and new development can hide those characteristics or cause them to fall out of favor with residents, only to later be rediscovered. In Springfield, important elements like the riverfront have become disconnected, or inaccessible to pedestrians, due to the introduction of modern infrastructure like the elevated highway. The same can be said for parks, squares and streetscapes that have become blighted or unsafe. Rather than remove these spaces and start from scratch, they can instead be infused with energy and commerce. Springfield has a hierarchy of urban spaces that have the potential to support a range of active and passive uses. Downtown is characterized by a mix of historic properties, modern high-rises and remnants of Springfield’s industrial past. This includes a Main Street corridor populated with low- and mid-rise brick buildings with ground-floor retail that in many locations lack a continuity of storefronts. New development can play an important role in infilling these gaps. When helping MGM Springfield create its vision for an urban casino, Form + Place contemplated the project’s role in defining a new entertainment district for the city. This included understanding its relationship to the river, Court Square and other smaller scale urban pocket parks. At the core of the development, a new urban environment has been designed to complement and enhance Springfield’s larger public realm and become a focal point for the city’s South End. Main Street is downtown Springfield’s commercial backbone. The corridor links important cultural, civic and economic pillars of the community, which required MGM Springfield to be strategic in how it engaged with the existing spaces. From a placemaking perspective, several studies were undertaken to reposition the surrounding neighborhoods and develop a streetscape that would appeal to pedestrians. Large-scale mixed-use projects are often designed in a vacuum with little effort to engage their immediate surroundings, but MGM and their partners focused on creating an active street-level experience, featuring restaurants, coffee shops and retail that complement existing locally-owned commercial space. Adjacent to the casino, Form + Place produced planning studies for Davenport Square, a mixed-use project with outdoor dining, retail, medical office and daycare facilities. This infill project occupies the city block across from MGM’s outdoor plaza and will further encourage pedestrian activity along Main Street by revitalizing a section of the city that was impacted by a tornado in 2011. MGM Springfield’s agreement with the city also calls for the development of 54 market-rate apartments, which will bring more full-time residents downtown and contribute to a mixed-use equation that should create a new 24/7 vibrancy to the area. A key aspect of placemaking is the development of a catalyzing project. These initiatives engage the public realm and help orient community activities around the space. They build momentum in these walkable centers, encourage more visitors and further development. 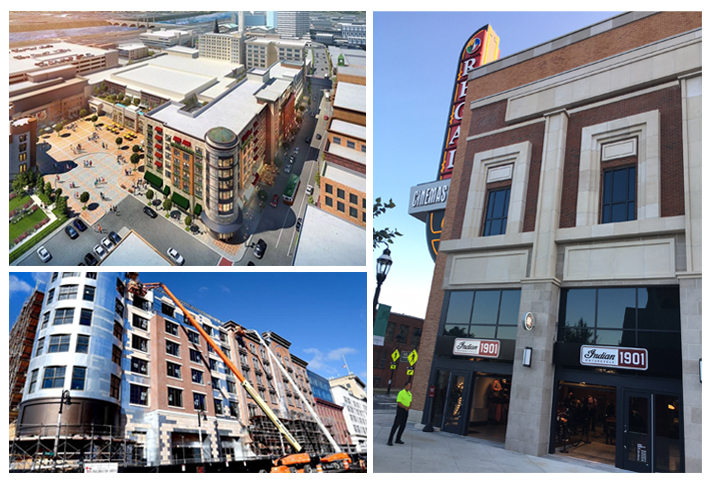 At MGM Springfield, Form + Place recommended the outward focus of retail and entertainment venues to better engage with existing activity in downtown Springfield and to help stimulate economic development along the Main Street corridor. This new urban mixed-use prototype is part of a larger trend toward placemaking. In Las Vegas, MGM is experimenting with this strategy by opening retail stores up to the strip to create a walkable plaza for dining, shopping and entertainment. In addition to the focus on Main Street, MGM Springfield has created a midblock urban gathering place that will offer seasonal programming, such as outdoor concerts during warmer months and ice-skating in the winter. Lined with shops and entertainment venues, including an eight-lane bowling alley, a 35K SF cinema and a Topgolf facility, this new destination will be an amenity for visitors and locals alike. As part of its mission to become a part of the fabric of Springfield, MGM chose to preserve and integrate several historic structures into the development. At the heart of the retail and entertainment venue is a restored State Armory building, which housed Springfield’s community center until the 2011 tornado. Form + Place saw the opportunity to use the original form of the armory’s shed trusses and the castlelike main facade to memorialize the original structure while creating a publicly accessible market space with daily event programming. MGM Springfield’s development plans, which span 14-acres in downtown Springfield, also included the 130-year-old First Spiritualist Church, which was moved from its original location on Union Street and repurposed as a Kringle Candle shop. MGM used the facades of other important buildings on State Street and Main Street for its hotel and corporate office spaces while renovating their interiors. These design decisions were part of MGM’s strategy to reuse existing buildings and preserve the city’s character. What ties MGM Springfield and the redevelopment of Springfield’s South End together are the experiences the downtown area now offers visitors and residents. It is a place that is infused with venues that offer social activities, great entertainment and dining options and a vibrant urban shopping environment. At the new plaza surrounding the Armory, visitors will experience a seasonal rotation of events and amenities including food carts, live music, car shows, outdoor games, yoga-and-beer nights and a pop-up art gallery, the Hartford Courant reported. MGM’s focus on programming emphasizes their commitment to creating a public realm that will actively engage the community. Planning for the project started as far back as 2012, and MGM, Davenport and Form + Place collaborated closely with the city and key stakeholders to ensure that this development would not only be a new economic engine for the downtown but also one that would complement the community. To achieve that goal, an early awareness of the role placemaking plays at every scale, from the project site and the streetscape to the commercial district and the city, was critical. 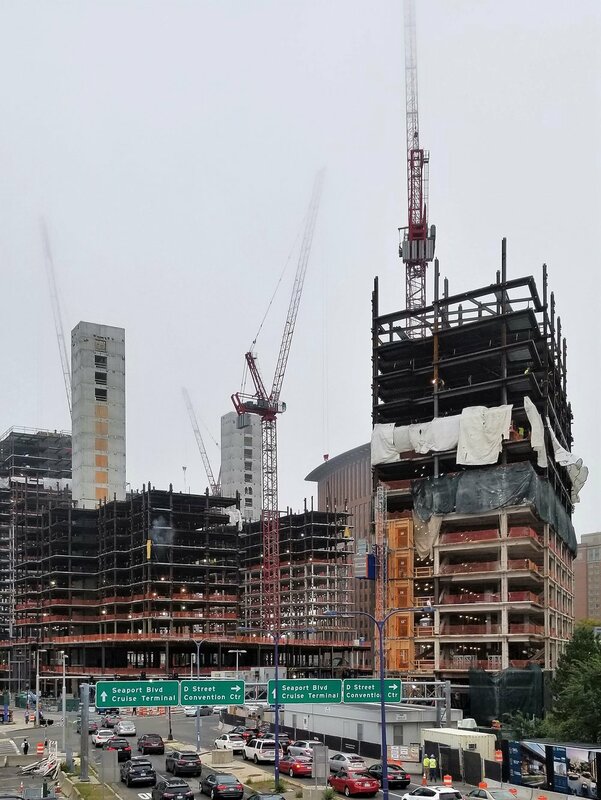 This feature was published by Bisnow on 9/18/2018. It was produced in collaboration between Bisnow Branded Content and Form + Place. Bisnow news staff was not involved in the production of this content.